BEIJING--(BUSINESS WIRE)--VIPKID, the world’s largest online English education company, announced today that it has raised $200 million in series D financing, the largest round of funding ever raised in the sector. This landmark round was led by Sequoia Capital and joined by strategic investor Tencent as well as existing shareholders Yunfeng Capital, Matrix Partners China and Zhen Fund. Tencent has also announced a strategic partnership with VIPKID in the areas of cloud computing, artificial intelligence, online education, and education for the social good. Founded in October 2013, VIPKID has quickly become an industry leader and innovator in online English language education. VIPKID’s one-to-one online education model of connecting English language learners with the world’s best teachers, has gained rapid adoption among Chinese parents. As of August 2017, VIPKID has more than 20,000 teachers delivering daily lessons to 200,000 paying students from 32 countries. VIPKID’s monthly revenue reached a record high of RMB 400 million (US $60 million) in July 2017, increasing the projected annual revenue to RMB 5 billion (US $750 million). 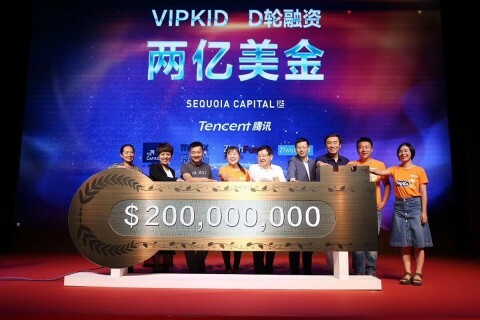 Since its initial angel investment in 2013, VIPKID has attracted capital from renowned investors such as Sinovation Ventures, Matrix Partners China, Sequoia Capital, Yunfeng Capital and Bryant Stibel. Cindy Mi, CEO and Founder of VIPKID, believes that raising such an unprecedented level of financing in this industry is a testament to the global success of the “shared education model.” Mi revealed that the newly raised funds would be primarily used for three purposes. The first is enhancing VIPKID’s educational offerings including: its teaching quality, development of contextualized textbooks and user experience of online classrooms. The second is promoting Lingo Bus, a new platform for children to learn Mandarin online. The third is increasing VIPKID’s social contribution through philanthropic initiatives. Through its partnership with the Jack Ma Foundation, VIPKID will expand its online English education program in rural China from five to 100 schools this year. The same afternoon, VIPKID also announced the launch of Lingo Bus, a new platform for children to learn Mandarin online. Lingo Bus, designed for students ages 5 to 12, is the world’s first fully immersive online Chinese learning program. As China’s presence on the global stage continues to rise, Lingo Bus hopes to be a pioneer in bringing China to the world and bringing the world to China. For the upcoming “Belt and Road Initiative” Lingo Bus hopes to foster interest and promote the accessibility of Chinese in these regions. Lingo Bus aims to attract 50,000 paid users and 10,000 professionally trained Mandarin teachers over the next three years. VIPKID connects children in China with the world’s best teachers for real-time, one-to-one online English immersion learning. A global education company, VIPKID’s mission is to inspire and empower every child for the future. VIPKID adheres to the belief that education is not one-size-fits-all and that all students are unique and the world is within their reach when connected with great teachers capable of personalizing learning and sparking curiosity. Founded in 2013 and formally launched in 2014 after a year of piloting and curriculum development, VIPKID has become China’s market-leading education startup, attracting investment from Sinovation Ventures, Sequoia Capital, Yunfeng Capital, Matrix Partners, Learn Capital, Northern Light VC, Bryant Stibel, among others. The company offers a progressive pedagogy based on the US Common Core State Standards and now serves a community of over 200,000 paying students and over 20,000 teachers in the US and Canada. In 2017, VIPKID and Jack Ma Foundation launched an English-language education initiative for schools in rural China with the goal of reaching 200 schools in rural China in two years. For more information, please visit: www.vipkidteachers.com.